Free Range in London 2012 . Art in Adsetts Library. Sheffield Hallam University. Since 2012 until Now. Conceived in the 50’s and delivered in the 60’s, Park Hill is an amazing landmark, the most ambitious inner-city development of its time; it was opened in 1961, to replace slum terraces, which were a mecca for gangs and criminal behaviour. Park Hill built for Sheffield Council, by Sheffield council. It has just under1000 houses with room for other accommodation such as shops, pubs and schools. The number of occupants is between 1500 and 2000. This radical structure was built to establish a reformed working class community, however the streets in the sky, in the end did little to cement communities. This romantic, hopeful vision of modernism fell into decline in the eighties. Today, Park Hill is given a new lease of life. There are still problems, the economy is poor and so is the health of people. There is today, much interest in our health. Too many people eat the wrong type of food and don’t exercise enough. The question must be, how do we address this problem? There are many well-designed restaurants; some may use locally grown, organic produce. Research shows there are no restaurants that grow on site and give you the opportunity to cook the produce after you harvest it. Education is very important in combating poor diet. 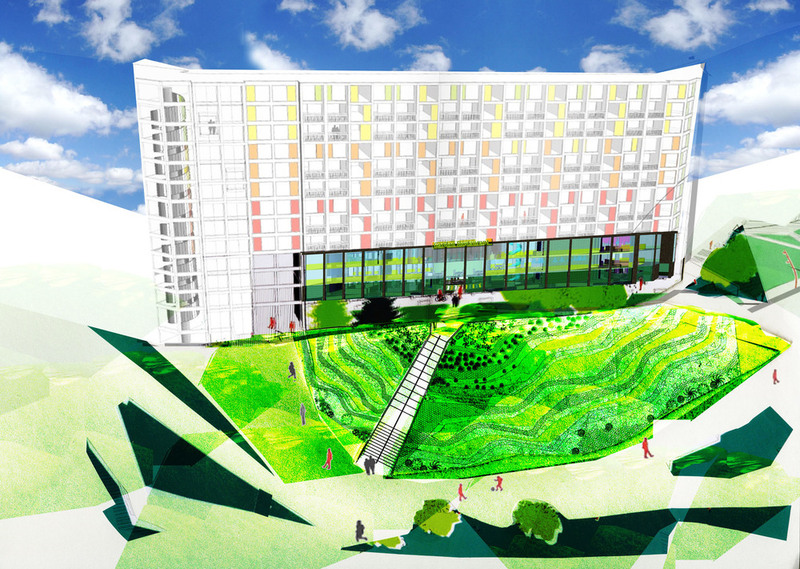 The proposal of an organic restaurant of this kind at Park Hill, offers a perfect opportunity and the means to educate and feed people the right types of food. In doing so, not only will they be in better health but also the restaurant will play an important roll in making Park Hill a community again. Eating in the restaurant will be a very pleasant, calming experience. The sights and sounds are natural, with the aim to bring the outdoors in. There will be living walls, water screens, growing plants, an oasis in the heart of the city of Sheffield. The project Aim to provide an organic restaurant which people will watch the process of cooking by professional chefs. The community will plant and grow their own vegetables and fruit. A greengrocer will be linked to the restaurant.